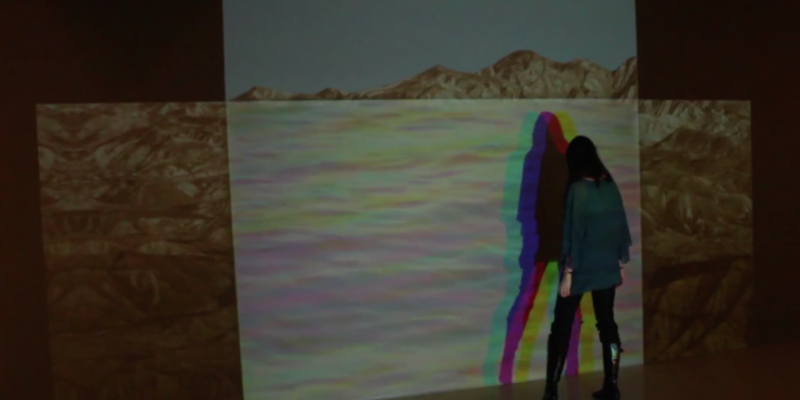 Victoria Febrer’s latest interactive projection installation, MarDesierto/DesertSea has been selected as a finalist in in this year’s Digital Graffiti festival. Post-production of the piece was done through a collaboration with Pedro J. Padilla. At this link, you can see an interview between the curator and myself about the piece. MarDesierto/DesertSea, attempts to make visible the relationships between landscape, history, and those who briefly inhabit these vast expanses. Our personal and universal feelings of connection to history and landscape through memory are but a glimpse into the network that connects us. This interactive installation considers not just roles of the artist and viewer in the act of remembering, but the sea, the desert, the wind, the salt, the earth, and the light in this process—the way that the non-human elements exert their existence and connect us to history, time, and geography.